Fortis uses the term "engraved indices" which is a good description of how this dial achieves a multi-level effect. Large bright white indices, Arabic numerals and sword styled hands set against the engraved, chiseled matte black dial provide excellent legibility even in low light. 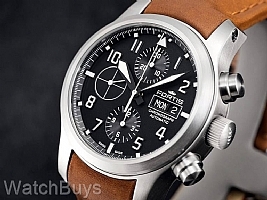 Large pushers drive the chronograph function, complete with a central chronograph hand, a thirty minute elapsed counter at the 12 and a twelve hour elapsed counter at the 6. The commanding presence of this watch comes from a combination of size and legibility as the 42 mm case and integrated strap design make the Fortis Aviatis Aeromaster Chronograph ideal for everyday wear. In fact, the 42 mm case diameter is not a coincidence as this new model is based upon the design of the legendary Fortis B-42 model. As a result, the DNA of the Aeromaster is shared with the Flieger and Flieger Professional models and connects directly with Fortis' storied history in the aviation industry. This watch is fitted with a sapphire crystal with double anti-reflective coating for legibility in a variety of lighting conditions. As an added benefit, this watch also features a day/date display at the 3 position. This watch is fitted with a brown leather strap with a Fortis tang buckle. Screwed lugs offer additional security while on the wrist. Verified Owner Comments: The Aviatis Aeromaster Chrono is exactly what I had hoped for ... Solidly made, chunky pilot/sport chrono. The matte dial has to be seen in person to appreciate it (just amazing) and the beefy crown and chrono pushers fit the case asthetic perfectly. Such a great piece, by an often underappreciated brand (to every watch enthusiasts detriment IMO). To top it all off, WatchBuys was so easy to deal with and the watch arrived (in Canada) next day! Thank you, WatchBuys! "Great Watch, One of the Best for that price range"
Verified Owner Comments: I just got this and the quality is amazing!!! Best you could get in that price range. The watch is doing +5sec per day which is great for a watch just out of the box, the watch is within COSC specs, doing better than other watches I have more than double the price!!! If you like the photos you won’t regret it because the real piece is even better!!! Good work FORTIS and WatchBuys thanks for the smooth and fast transaction. Service to detail by phone, mail and shipment. Special thanks to Matt, Kevin and Rob!! !